Baldachino, coffered ceiling and skylight in the Sanctuary of Blessed Trinity Church. Tuesday, April 16 at 7:30 p.m. ~ Choir rehearsal in St. Charles Hall. Wednesday, April 17 at 7:00 p.m. ~ Parish Council Meeting in St. Charles Hall. Thursday, April 18 at 8:00 p.m ~ Bingo will be played in St. Charles Hall. Saturday, April 20 at 8:00 p.m ~ Bingo will be played in St. Charles Hall. Sunday, April 21 following 10:00 a.m. Mass ~ Coffee Hour in St. Charles Hall, hosted by the Parish Council. Sunday, April 21 at 3:00 p.m. ~ The Trinity Concert Series continues in church with a performance of The Peacemakers by The Villa Maria Chorale. Monday, April 15 ~ Communion Service at 11:00 a.m. The Trinity Series, “beautiful music in a beautiful space,” continues on Sunday, April 21, 2013 at 3 p.m., when the The Villa Maria Chorale, under the direction of Ireneusz Lukakszewski, performs The Peacemakers by contemporary Welsh composer Karl Jenkins. The work honors inspirational figures whose voices changed the world. Musical tributes to Mahatma Gandhi, Nelson Mandela, Martin Luther King, Jr., and Mother Teresa, among others, are sung against rhythms and harmonies that reflect their origins and culture. Proceeds of the free-will offering will benefit The Chorale and Blessed Trinity’s Under This Roof building maintenance and restoration fund. Click HERE to learn more about The Peacemakes and The Villa Maria Chorale. The Buffalo Brass Choir ~ And speaking of concerts, the Buffalo Brass Choir, directed by our own Nick DelBello and featuring Jonathan Lombardo, principal trombonist of the BPO, performs Orchestral Fireworks on Sunday, April 14 at 3:00 p.m. at Rockwell Hall onn the Buffalo State College Campus. Click HERE to learn more. 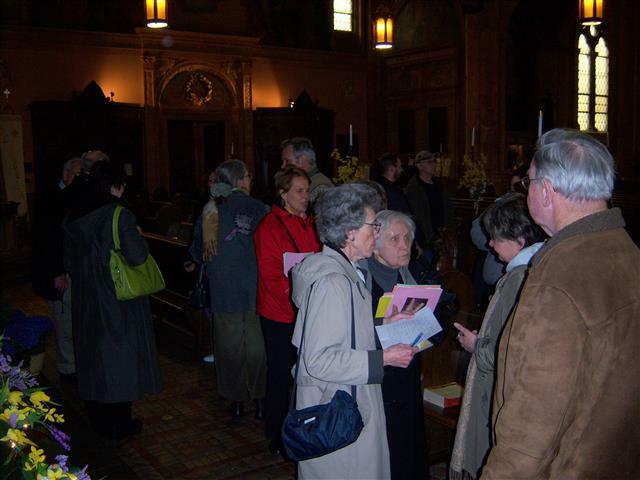 The April 13 docent training class ended in Church. Here, some of the 25 who attended compare notes and select an area of the church for their Class 2 presentation. Blessed Sacrament Church, Buffalo, as part of its year-long 125th Anniversary Celebration, is pleased to welcome nationally-known syndicated columnist and author E.J. Dionne, Jr. to Buffalo on April 17, 2013. In his presentation, “Our Divided Political Heart and the Election of 2012,” Mr. Dionne will speak on how we Americans deal with the tension between two core values; i.e., our love for individualism and our reverence for community. He will speak at 8:00 p.m. at 710 Main Theater (formally Studio Arena Theatre). Tickets are priced at $20 for adults and $10 for students with ID. Tickets can be purchased at the Shea’s Buffalo Ticket Office located at 650 Main Street in downtown Buffalo; by calling Ticketmaster (1-800-745-3000); or online at www.ticketmaster.com. Buffalo Jazz Review ~ Saturday, April 20, 2013 at 6:00 p.m. Performances by Mount St. Mary Jazz Ensemble, Depew HS Jazz Ensemble, St. Francis HS Jazz Ensemble, Tonawanda HS Jazz Ensemble and Sweet Home HS Jazz Ensemble will take place at Iris Restaurant (corner of Sweet Home Rd. & Maple Rd.). Admission: $7 presale and $9 at the door; Children under 5 are free. Call 716-877-1358 for more information or tickets. Mass of Thanksgiving ~ The Felician Sisters invite you to a Mass of Thanksgiving in celebration of the twentieth anniversary of the Beatification of their foundress, Blessed Mary Angela Truszkowska. 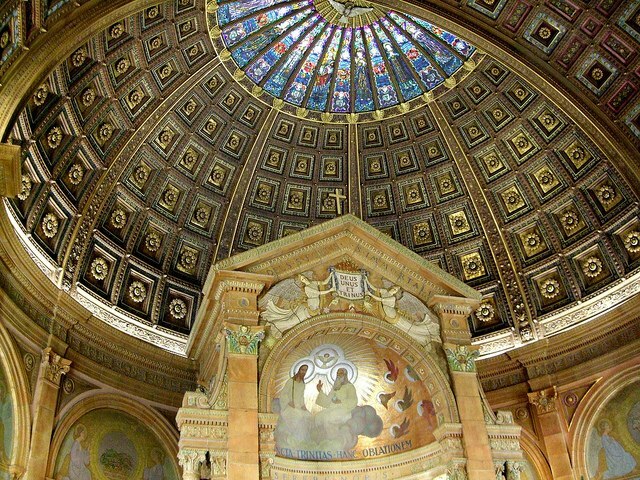 The Mass is scheduled for Sunday, April 28, at 2 p.m. at Villa Maria Convent Chapel, 600 Doat Street, Buffalo. Participants will also have the opportunity to recite the Litany to Blessed Mary Angela and venerate her relic immediately after the liturgy.